It’s been a year in the making and finally, I did it, I changed the name of this blog. Why? Well, as much as I loved: The Bitchy Writer’s Blog, it was holding me back. You see, I write for children and teens now and as you can imagine, people might have a problem with the B word. It was perfect when I was freelancing, but as a children’s author, it’s a huge hindrance. 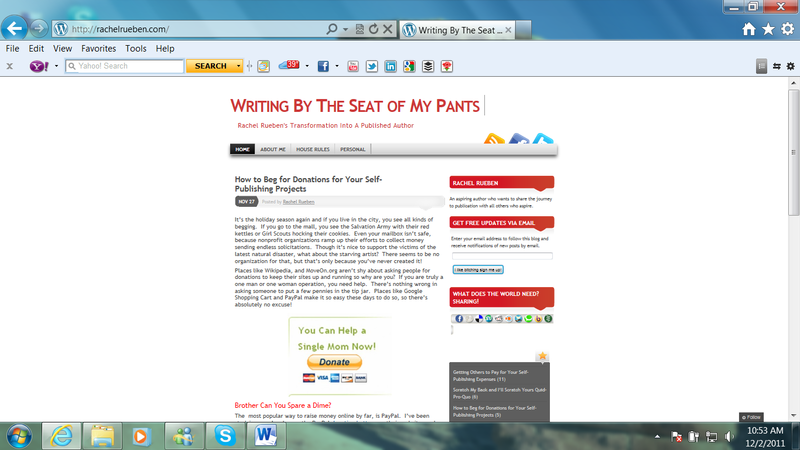 So I’ve renamed the blog to: Writing By The Seat of My Pants. I also bought my own domain name and linked it to this blog: http://www.rachelrueben.com. It makes me much easier to find online, not to mention, appealing to a PG audience. I always complained when I couldn’t find an author’s website or blog during our podcasts and here I was, being just as invisible as they were! Pot calling kettle, can you hear me? You Attract More Flies with Honey! I even jazzed up my sight making it more clean and easier on the eyes. So all the pretty colors are gone! I didn’t want people repelled because of the motif. Eventually, I’m going to buy a Premium theme to look more professional but for now, the Mystique theme is adequate. I’ve been observing other successful blogs and finally got a game plan together. It’s funny, I’ve been able to help others with their blogs and even helped them gain more viewers, but when it came to my own, I was at a total loss. It’s the physician heal thyself syndrome. I had so many ideas but I never knew where to start. So here I am relaunching my blog to fit my new author image! In the future, I’m going to add a few more pages to display my work, sort of like a portfolio. I was actually thinking about posting my starter novel Eternal Bond, but I’m not sure, that’s a lot of work with all that formatting and WordPress can be a pain when I comes to formatting! So let me know what you think. If you got suggestions or tips I’d love to hear them. We need more insights like this in this theard. See what happens when you follow your instincts? Great job on transforming the blog! Thanks for the help! Without you, it would have been impossible. Nice, very nice. Think I should re-do mine?